Before we begin reporting on his talk, let’s get something out of the way that Laurence Garvie, research professor and curator for Arizona State University's Center for Meteorite Studies at the School of Earth and Space Exploration, has been hearing about for two weeks. Whatever killed the Indian bus driver about two weeks ago was not a meteorite. Meteorites don’t create explosions, he explained. And the likelihood of someone being killed by a rock falling from space is still astronomically low. Garvie presented several numbers during his lecture, all of them fascinating. “As these objects come into the atmosphere, they produce a massive spectacle,” he said. Meteorites are not hot and glowing when they hit the ground. In space, heated by the sun, they might only reach 200 degrees. Even when they fall through the stratosphere, they only have about four seconds to get hot. Garvie compared them to Baked Alaska; the inside is still cool. Meteorites fall everywhere, but they’re tiny. 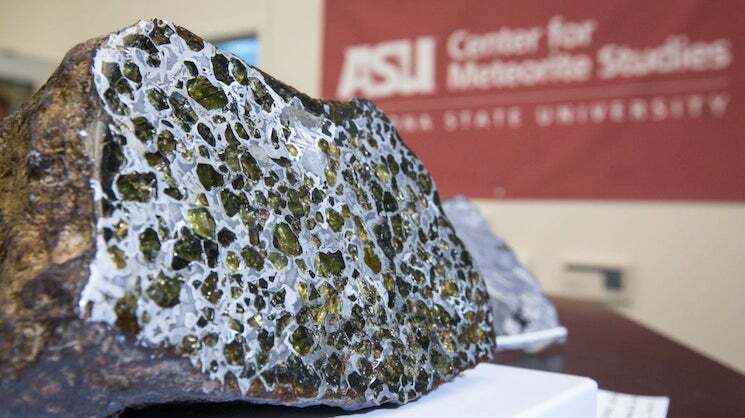 “The vast majority of meteorites are about a centimeter or so,” he said. “Fortunately for us the very large events are rare,” Garvie said. A fall like the one captured on many dashboard cameras three years ago in Chelyabinsk, Russia, happens about once a generation. A Tunguska-level eventThe Tunguska event was a large explosion that occurred near the Stony Tunguska River, in Yeniseysk Governorate, nowKrasnoyarsk Krai, Russian Empire, on the morning of 30 June 1908 (N.S.). The explosion over the sparsely populated Eastern Siberian Taiga flattened 2,000 km2 (770 sq mi) of forest and caused no known casualties. The cause of the explosion is generally thought to have been a meteor. It is classified as an impact event, even though no impact crater has been found; the meteor is thought to have burst in mid-air at an altitude of 5 to 10 kilometres (3 to 6 miles) rather than hit the surface of the Earth. — Wikipedia as happened in Russia in 1915 occurs about once every 100 years. Chicxulub, which slammed into the Yucatan Peninsula, wiped out the dinosaurs and trashed the entire planet, is likely to occur only once every 100 million years. A 100-foot-diameter asteroid is orbiting Earth in a wobble and will next pass by in March. Scientists estimate it has a one in 250 million chance of hitting Earth. If it does, it will create a crater only a few hundred meters wide. The School of Earth and Space Exploration’s New Discoveries Lecture Series brings exciting scientific work to the general public in a series of informative evening lectures, each given by a member of the faculty once a month throughout the spring. The School of Earth and Space Exploration is an academic unit of the College of Liberal Arts and Sciences.